We've booked a table for the 27th of June at Warhammer World in Nottingham for this 4500 points per side game. Why so low for an Apocalypse game? So we can all turn up with our usual tournament armies of course. This should keep the armies relatively dymanic while making the game fast and tactical. James will also get to field his entire Dark Angels army. So that will be 1500 points of Ravenwing, 1500 points of Deathwing and 1,500pts of regular Dark Angels. Meanwhile I'll take my 1500 points of mechanised Tau, Simon will take his 1500 points of mixed Tau and Luke will take his 1500 points of gunline Tau. This is quite an ambitious project, but basically I plan to provide tactics on how to use EVERY unit in the Tau army. Each unit will have its own tactis entry, detailing its use, common tactics employed, which units it works well with and how the different weapons options for it work...and which ones don't. Then, to top it all off will be the Complete Tau Tactica, giving an overview on the army as a whole, as well as a brief overview of each unit with links from each unit going to the tactics article written for that specific unit earlier. No battle report this week? Afraid not. I'm frantically painting up some Tau Battlesuits, planning the apocalypse game and sorting out my Space Wolves army. Don't forget that I have a full time job, girlfriend and drinking buddies too! 4500 points of Tau? Fun! I've got an Apocalypse game coming up where I'm fielding 5000 points (by myself! *gulp*). But that doesn't happen until July. Can't wait to see your game! Yeah, that is quite a lot of tau. I cannot wait! 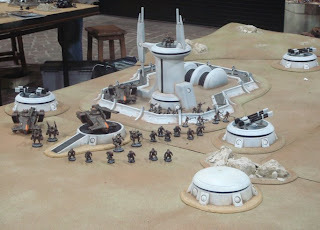 That Tau terrain is a thing of beauty, my friend. Really top notch. Your army sittin' on it makes it look even better. Guess the Dark Angels are gonna come spoil it, though. Looking foward to the BatRep. Oh, BTW. Regarding the whole Space Wolves Army thing? I got to play on that board at Warhammer World, incredibly good terrain. Hopefully next time I go my army will be painted. Looking foward to the tacticas! 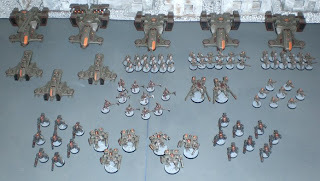 Really, a very nice imagination of a huge Tau army.